Hyderabad (VSK). Making a call for drawing deep out of the wisdom of our seers, Sarsanghchalak Dr. Mohan Bhagwat Ji said that our NeetiShastra has a lot to offer which modern day law makers should take a leaf out. He was speaking at the valedictory program of the Silver Jubilee celebrations of the Akhil Bharatiya Adhivakta Parishad held at Saroornagar Indoor stadium at Hyderabad on Sept 10th, 2017. 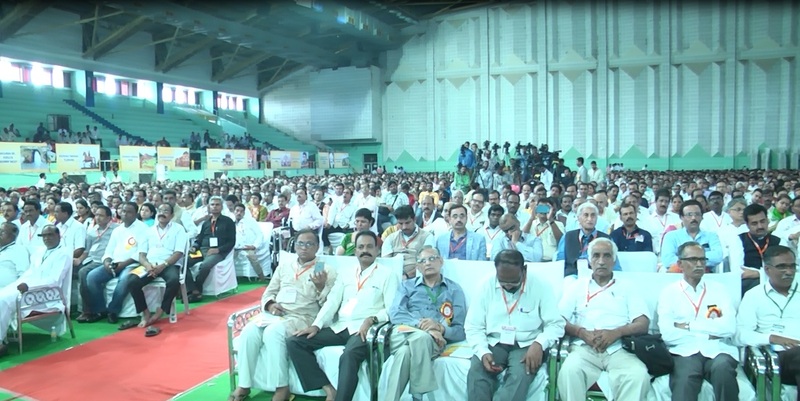 Mohan Ji said that while Laws and legislation are necessary for running society, we must build such a society where morality of the society is at a level where the society in general and law are not at loggerheads with each others. 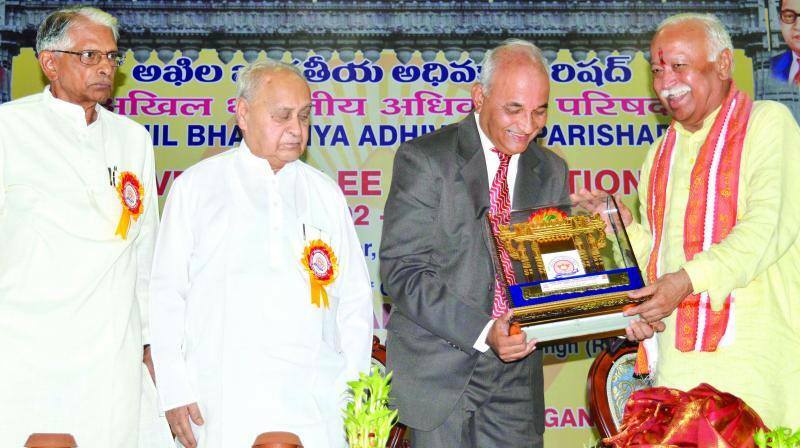 The Adhivakta Parishad was formed in 1992 under the guidance of Dattopant Thengadi Ji during a time when the Shah Bano Case judgment, and the discussion on Hindutva was raging. The nation was in a huge debate as to who were as a nation. Couple of the key functions of the ABAP was to fight many of the legal issues that were coming up during such time and also to give voice to the millions of the people who could not afford legal assistance. He said that enforcement of law is necessary no doubt but that it will be 100% effective only when there is education of the masses, Secondly this education cannot be just by information, but should include moral based education. 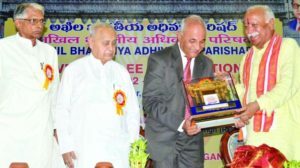 Thirdly he said that people learn by examples and that the legal fraternity must set examples of honesty and life based Bharatiya values so that the faith of people in judiciary upheld. ABAP must work towards building honesty among the fraternity and society, build solutions and if necessary transform. 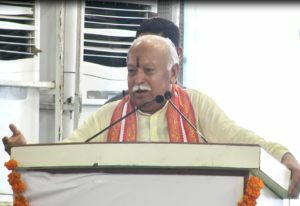 Pitching for reforms in the law, he said, while our constitution was written based on the understanding of Bharatiya ethos of our founding fathers, many of the laws that we are still using are based on the foreign sources. This is something we must address he added. He recalled the case of Bhagwan Birsa Munda and 400 other (vanvasis) tribals who were tried by the British for their battle against the British. Unfortunately, what the tribals were saying was being mispresented by the interpreters, (who were also government employees). This gap doesn’t seem to have been resolved even today. Our justice system’s ambit is under legal framework but many a time what is legal many not be morally right. For example, During Emergency, police had the right to shoot anyone and one shot could not ask a question. Legally the police was right but morally? I recently asked our former President about what the definition of legality. He said “In Bharat, “Morality is legality”. But, is vice versa true? Unlike western society which believed that the king could do no wrong, In our society, during the coronation (rajyabhishek), the King used to say Adandosymi, (none can punish me). The purohit used to say “Dharma dandyosi” meaning Dharma will punish you if you do wrong. Dharma doesn’t mean mode of worship whereas it is the basis of welfare of the world. Dharma was placed highest because it stood for truth. “Other nations have their own jurisprudence. But does our jurisprudence reflect the moral and ethos of our society”, he asked? He pitched for working for transforming our legal system by working towards solutions that the poor and deprived are facing. He also appealed to the members of the legal fraternity to help those in duress beyond the boundaries of ideology. Appealing to those in the higher echelons of the legal system, he said that an error of character of those at higher levels have a higher impact on society. Transformation without destruction is possible only by association of people committed to a positive change and each one of us must work towards this. In last 25 years we have grown and ABAP plans to reach every court of the country but at the same time we must plan for qualitative improvements in our association too. “Satya ke aadhar par Dharma, Dharma ke aadhar par neeti aur neeti ke aadhar par vichaar must reflect in our life, he said. “Satya, Karuna, Suchita and Tapasya” are four 4 pillars of Dharma. As karyakartas of ABAP, our lives must reflect these values and when this happens the society will support us wholeheartedly.